North America is home to some incredible lakes, but none are quite as special as the five Great Lakes. A true natural wonder, the Great Lakes of North America are mostly found stretching across the Canada-United States border in the mid-eastern region of the continent. Of these lakes, Lake Erie is the fourth biggest. Bordered by Michigan, Ohio, Pennsylvania, and New York, as well as the Canadian province of Ontario, Lake Erie has around 799 miles of shoreline in total, with an additional 72 miles when including the lake's various islands. This means that Lake Erie is home to a lot of excellent beaches, especially in the state of Ohio. Lake Erie beaches provide astounding views of the lake itself and surrounding scenery, and each one is perfectly unique, with its own advantages and features. Some of Lake Erie's beaches are relatively untouched, offering pure beach-going experiences that eco-tourism enthusiasts will undoubtedly adore, while others feature various amenities like restrooms, concessions, equipment rentals, play area, and organized activities like kayaking and paddle boarding. With centuries of history behind it, Lake Erie is a must-visit location for nature lovers and outdoor enthusiasts. It's home to all kinds of wildlife and surrounded by majestic scenery that never gets old. Admiring that scenery from one of Lake Erie's many beaches is a wonderful way to spend some time, and there are lots of great shoreline locations spread out along the lake. Let's take a closer look at some of the best beaches at Lake Erie. Not far from Cleveland, Fairport Harbor Lakefront Park is another beautiful beach location at Lake Erie. The full park covers 20 acres of land, offering a lot of space for everyone to enjoy. As well as the soft sands and inviting waters of the lake itself, this beach also features a lighthouse and marine museum. Concessions can be found offering a range of tasty snacks and drinks, and there are also kayak and canoe rental operators in this area proposing various guided tours of Lake Erie. Perhaps the best beach on the Canadian shore of Lake Erie, Crystal Beach is a south-facing beach and was named after the crystal waters of the lake itself. The area was once a huge tourist attraction, being home to the famous Crystal Beach Amusement Park, which ran for over a century before closing in the late 1980s. The park has since been replaced by an elite gated community, the Crystal Beach Tennis and Yacht Club, and the area is also home to a spa, yoga studio, and various upscale eateries. It's a great place to spend a day and the beach benefits from gentle slopes into the water and cool breezes that are very welcome on sunny summer days. This is only a small beach, stretching out for just a few hundred feet in total, but it's one of Lake Erie's true little gems. Geneva State Park Beach is equipped with a marina, hiking trails, a picnic area, and even a campsite. Lifeguards are also employed at this location, which is a very popular Lake Erie swimming spot. Crowds can gather here in summer, so this isn't the best beach for people who want privacy, but it's definitely one of the top spots to enjoy the waters and views of Lake Erie. 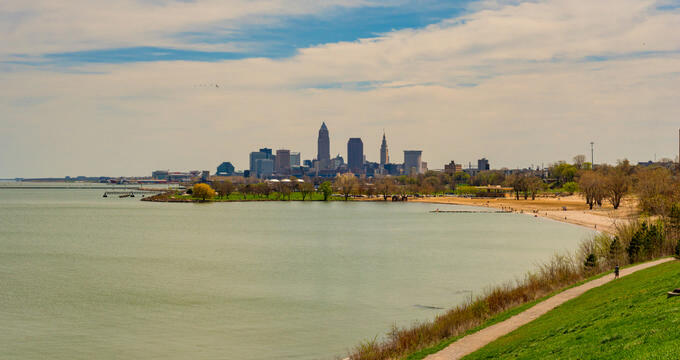 For Cleveland residents and visitors, it's hard to find any better beach than Edgefront Park Beach. Easily reached from the downtown districts of the city, this beach offers a full park experience, with benches, picnic tables, play areas, and incredible views of the city skyline that blends slowly into the natural scenery of Lake Erie itself. Since this is one of the main Lake Erie beaches for Cleveland, it can get quite busy at certain times of year, especially during the summer and on special occasions like the 4th of July, but it's quite a spacious area with a lot of room to cope with big crowds. Covering around 3,200 acres, Presque Isle is Pennsylvania's only real stretch of shore along Lake Erie and is a highly popular recreation location for the state and surrounding area. 'Presque Isle' is a French term which translates to 'Almost Island' due to the fact that this particular patch of land is very close to being an island but is still connected to the mainland by a slim stretch of land. Presque Isle is open throughout the day and is a popular area for all kinds of outdoor activities like swimming, fishing, hiking, and boating. The beach stretches out all around Presque Isle, offering a lot of space to cater to large numbers of guests. You'll have a good chance of seeing some wildlife here and various special events are sometimes organized at Presque Isle too. Cedar Point is more known for its rollercoasters and attractions than its beach, but the 'Roller Coaster Capital of the World' also has a lovely lakeside location with soft sands and gentle waters. It's only a short step away from the noise and excitement of the rides, but offers a nice relaxing spot that is distinctly separate from the park itself. Plenty of great amenities can be found right nearby, including restaurants and hotels, so Cedar Point is an excellent Lake Erie beach to check out if you’re in the area for a few days.